I hate to break this to you, but you are not omniscient. Perhaps more disturbing, you can’t be. This is a point that many humans seem to like to ignore. Choosing to believe that even if they don’t know everything now, they certainly could if they put their minds to the task. This finite capacity for knowledge leads to all sorts of interesting human behavior. In this post I ponder why our knowledge is limited. 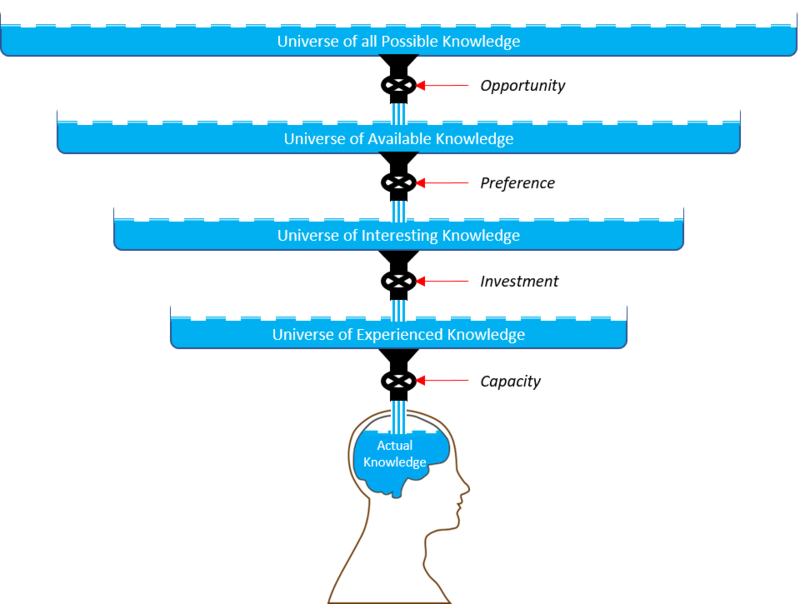 Several mechanisms are in play that reduce the universe of all possible knowledge to the actual knowledge in our heads. One possible metaphor for this is to imagine a series of progressively smaller buckets each containing some subset of all possible knowledge. Knowledge flows from the larger buckets to the smaller buckets modified by various filters or valves. The final bucket is the knowledge in our heads. The largest bucket, the universe of all possible knowledge, (not drawn to scale) is every bit of knowledge in every possible universe that exists and perhaps might exist, at all moments in time. To paraphrase Douglas Adams, the multiverse is big, really BIG. It’s not all available to us though (darn!). The universe of all possible knowledge is immediately pruned down to the universe of available knowledge by the opportunity filter. The opportunity filter consists of where we are in time and space and what we can use to detect the information that might become knowledge. Physically this is limited to the observable universe, time is limited to our lifespans, and detectability is limited at least by our cleverness; but it’s still big. The next filter is preference, which creates the universe of interesting knowledge. There are a lot of potential pieces of information that we don’t care about. Most of the time we don’t care about our most recent heartbeat or the current state of a particular blade of grass; though there are exceptions. If we preferred to pay attention to the entire universe of available knowledge we would be instantly overwhelmed. In this sense, preference is largely a defense mechanism but we experience people every day who are interested in things we don’t particularly care about. The universe of interesting knowledge is an opportunity rich space. To a degree we choose what we want to put into our heads. This is the investment filter. Note that just living is an investment and information is thrown at us just because we exist. This filter also captures the notion of what we actively do to shape the knowledge in our heads. This creates the universe of experienced knowledge. Finally, though it’s hard to accept, we are finite beings and our minds are finite vessels. We are subject to the capacity filter, which leads to the pool of actual knowledge in our heads. Our brains really do fill up and when they do things that were there get displaced through the process of forgetting. It’s pretty subtle. We tend to lose details rather than broad concepts or experiences. We also are good at abstraction, which is a form of lossy information compression. These and other mechanisms can make our capacity seem larger than it actually is. While our actual knowledge is much smaller than the universe of all possible knowledge, our capacity is still big, really BIG, but limited. Limitations come with implications. In future posts I’ll ponder some of these implications. As always, I thrive on discussion. If you have a different point-of-view, I’d love to hear about it.